People didn't even know where Gowanus was, how it's name was spelled or who was living there till near past. The neighborhood is getting more and more popular nowadays. Actually it is the same exact story we witnessed in Williamsburg, Dumbo and Greenpoint in the last decade. After being home to independent metal shops and local shipping industry for more than a century all the small manufacturers in the area are shutting down their shutters after the inevitable defeat in their long time battle against big companies and moving out of the city leaving all their spaces, lofts and shops to young artists, craftsmen, designers and entrepreneurs moving to the area. You don't have to be psychic to see the future. After the neighborhood becomes attractive and cool enough the real estate investors will storm in, purchase whatever they can find, kick out the low income young crowd by tripling their rents, build fancy high rises and renovate ultra expensive loft buildings for hipsters. I don't think it is something we can stop or avoid but at least we can try to support the young people and local businesses in the neighborhood to increase their chances to stay there longer. Gowanus was purchased in the mid 17th century by the Dutch settlers along with Red Hook and Bushwick from the Mohawks and formed altogether The Village of Breuckelen which was named after the borough Breukelen of Utrecht in the Netherlands. Eventually over time the name Breuckelen evolved to Brooklyn and got forgotten but hopefully will get popular again with the success of Brad Eastabrooke's distillery Breuckelen Distilling Co. Inc. I visited the distillery yesterday and met Brad and his girlfriend. He conducts his operation in a high ceiling former boiler room in Gowanus on 19th street with a single copper still imported from Germany using New York State grown ingredients as much as he can. 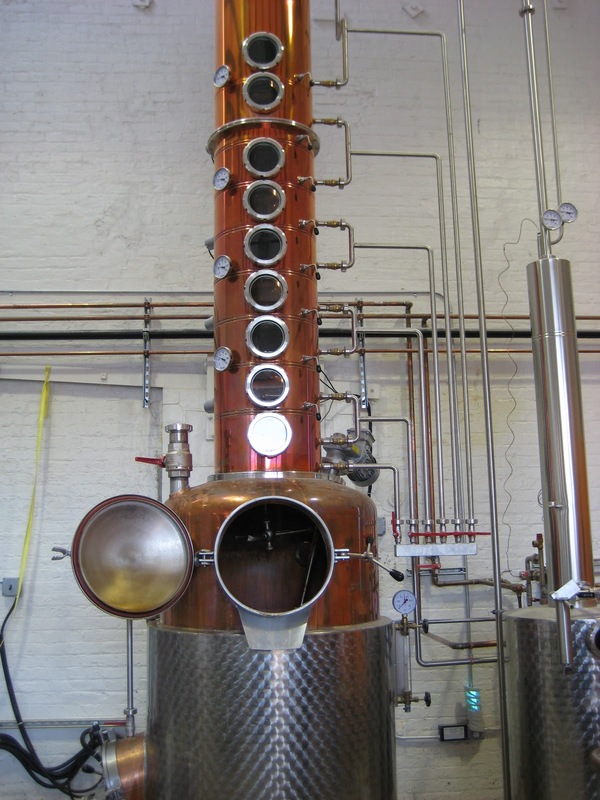 The distillery has one small stainless steel mash tun and several synthetic washback tanks. He is inspiringly excited and proud about his place and products. For now they are bottling and distributing Breuckelen Gin only to the local bars and big retailers in New York City but have solid plans for experimenting on whiskey. Recent local media interest must be also pretty encouraging for him. Actually I was a fan of their gin already which is a very successful product distilled from wheat with distinct citrus and rosemary notes. But I was also lucky to be able taste the first sample of their rye whiskey yesterday. The whiskey is distilled from about ninety percent rye and ten percent corn and only seven days old but it's color is already bright gold, has a promising sweet palate and a short but spicy finish. I hope they will offer tastings of different stages of the same spirit. It could be fun to keep track how it is evolving in time. Brad mentioned also that he has plans for corn and wheat whiskies in the near future. It looks like he will need a proper warehouse for his barrels soon. Breuckelen Distillery tasting room is open every day except Sunday and on Saturdays you can also take a little tour guided by Brad. It is a pretty nice way to spend a Saturday afternoon. I was sorry to miss this tasting and tour. 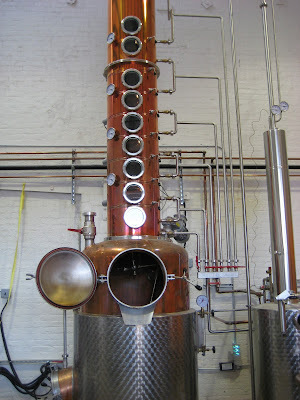 The still is beautiful! which subway line is this place close to?